« Decorah – Days 2 & 3 – is this Heaven? Trail Mix Van-cakes taste good to kids of all ages! Most camping enthusiasts love trail mix or pancakes but has anyone put trail mix IN the batter? It’s tasty and works great! Who needs syrup? Just a little butter or low fat butter substitute is sufficient. There are always a few envelopes of pancake mix in the van. I like the “complete” type packets because they are perfect for one or two people. You only need add water and can make just the amount needed. The trail mix used was Aldi’s “Indulge” variety. It contains peanuts, cashews, dehydrated cranberries, golden raisins, and various flavors of chips (white, peanut butter, and chocolate). Predictably, the peanuts and cashews were a bit too crunchy. The next time around, walnuts will be used since they crumble into more manageable bits. With a ton of black walnuts falling off the trees, now would be a good time to gather a few for cooking purposes. Otherwise, if using a commercial trail mix, smash or chop the nuts first. A person could always buy a little packet of ground nut topping. 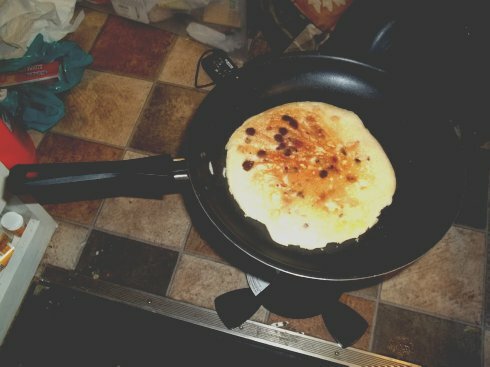 The white, peanut butter, and chocolate chips melted perfectly. I also recently saw cherry and blueberry flavored chips at the grocery store. They might be worth a try, too. As far as fruit goes, craisins (dehydrated cranberries) and raisins work fine but a person might want to “plump” them in the microwave for a few seconds. Fresh fruits such as diced bananas, blueberries, cherries, etc. would be wonderful and still add flavor and nutrition. 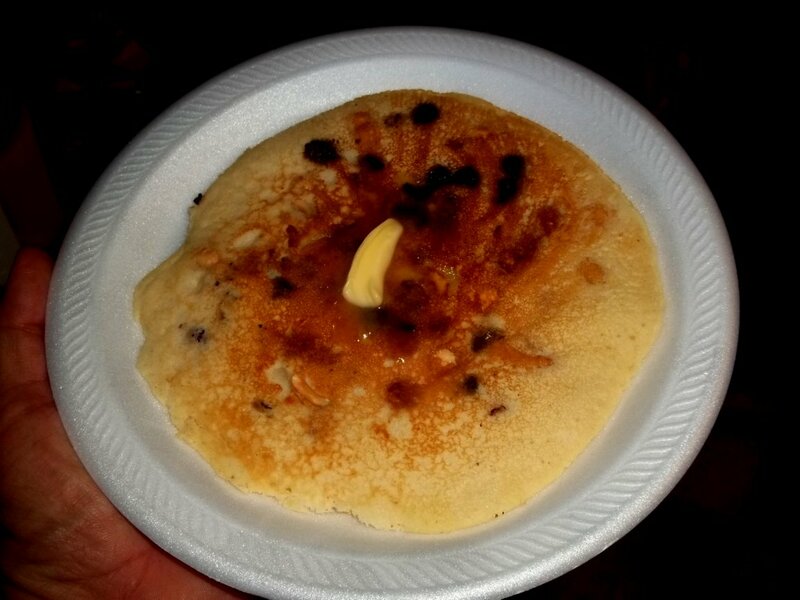 These trail mix pancakes (“van-cakes”) are worth trying, especially if you have kids. It might be a good idea to pre-mix the variety of fruits, nuts, and chips so you can whip up breakfast in no time. Thanks for popping in for breakfast. It’s always fun to share another cooking idea. I’m not a chef by any means but cooking and experimenting with foods and techniques is a hobby. I also enjoy reading others’ cooking tips, too! As campers and vandwellers, we tend to cook a lot of food and something new and exciting is always welcome. Have a spectacular fall day! Make it a great one! Loved the idea for something different for breakfast! Cook like/similar to grilled cheese sandwich. Enjoy.